Brenleires is distinguished as having the best Gruyère d’Alpage for the past five years by the 2014 Gruyere Cheese Association. At their chalets, terrain is steep and pasture is sparse, but very rich and diversified where it exists. Cristophe maintains the traditional heating method of a hanging vat over an open fireplace. 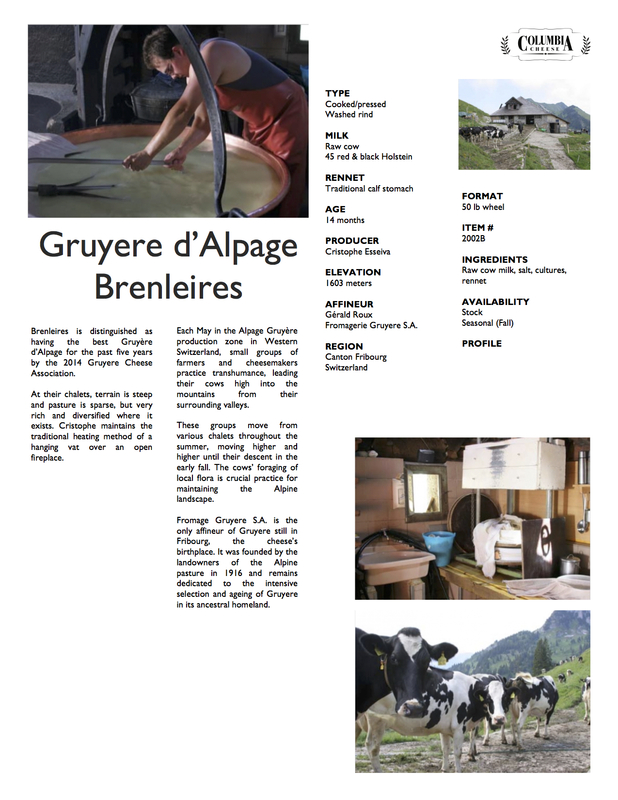 Each May in the Alpage Gruyère production zone in Western Switzerland, small groups of farmers and cheesemakers practice transhumance, leading their cows high into the mountains from their surrounding valleys. These groups move from various chalets throughout the summer , moving higher and higher until their descent in the early fall. The cows’ foraging of local flora is crucial practice for maintaining the Alpine landscape. Fromage Gruyere S. A. is the only affineur of Gruyere still in Fribourg, the cheese’ s birthplace. It was founded by the landowners of the Alpine pasture in 1916 and remains dedicated to the intensive selection and ageing of Gruyere in its ancestral homeland. AFFINEUR Gérald Roux Fromagerie Gruyere S.A.